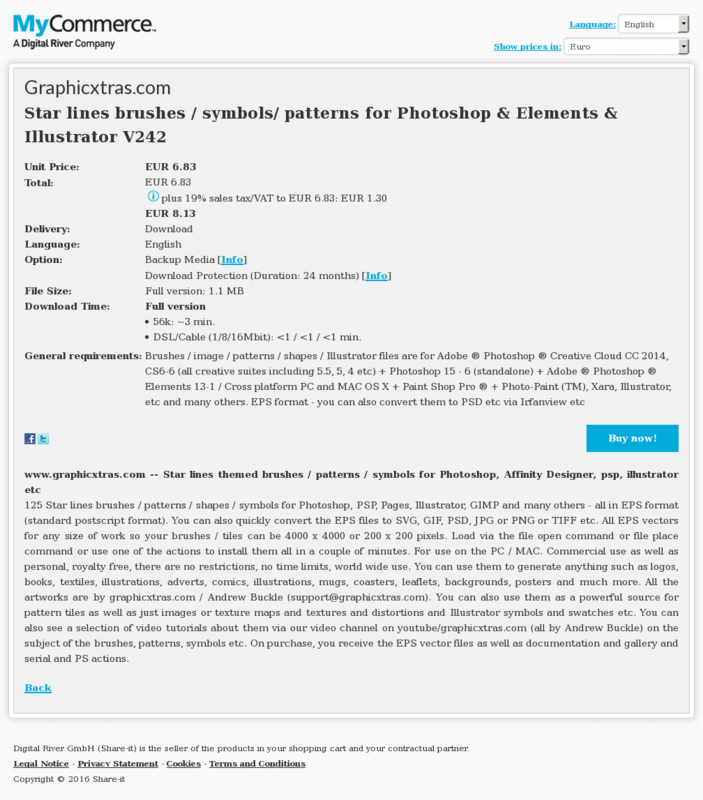 125 Star lines brushes / patterns / shapes / symbols for Photoshop, PSP, Pages, Illustrator, GIMP and many others – all in EPS format (standard postscript format). You can also quickly convert the EPS files to SVG, GIF, PSD, JPG or PNG or TIFF etc. All EPS vectors for any size of work so your brushes / tiles can be 4000 x 4000 or 200 x 200 pixels. Load via the file open command or file place command or use one of the actions to install them all in a couple of minutes. For use on the PC / MAC. Commercial use as well as personal, royalty free, there are no restrictions, no time limits, world wide use. You can use them to generate anything such as logos, books, textiles, illustrations, adverts, comics, illustrations, mugs, coasters, leaflets, backgrounds, posters and much more. All the artworks are by graphicxtras.com / Andrew Buckle ([email protected]om). You can also use them as a powerful source for pattern tiles as well as just images or texture maps and textures and distortions and Illustrator symbols and swatches etc. You can also see a selection of video tutorials about them via our video channel on youtube/graphicxtras.com (all by Andrew Buckle) on the subject of the brushes, patterns, symbols etc. On purchase, you receive the EPS vector files as well as documentation and gallery and serial and PS actions.